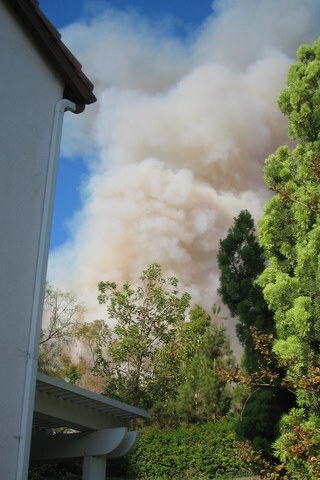 Here is picture of the Yorba Linda Fire from our house – we are about 15 miles south of the fire zone. Today, I went with Nikhil to the Mt. Sac Race. Amazingly, they still held the race near Diamond Bar and the air quality was still good this morning. On the way home, however, the 57 freeway was closed and we had to make our way south on city streets. It took about an hour to go 10 miles! We got back on the freeway heading south at the Lambert on ramp. Here we are escaping the smoke! 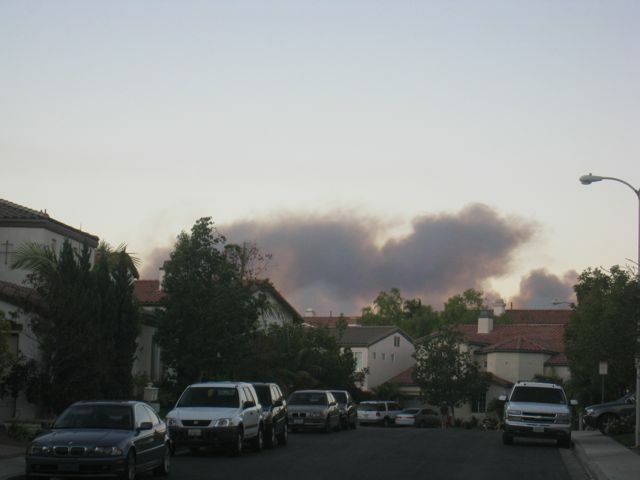 Yesterday the Irvine fire in Santiago Canyon came dangerously close to our house. 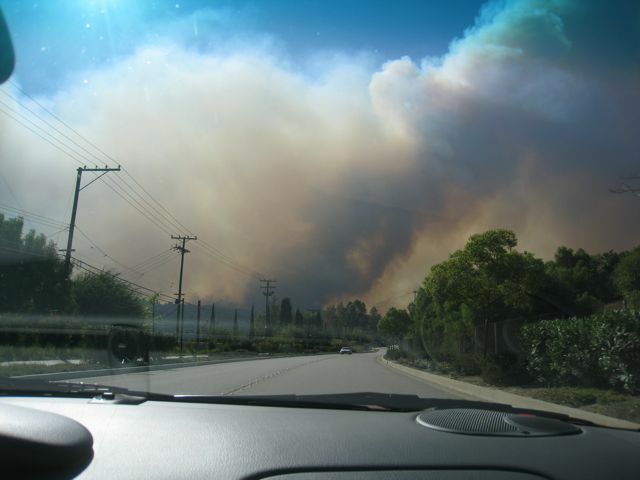 The Fire Department was doing mandatory evacuations and we had to leave at about 10pm. 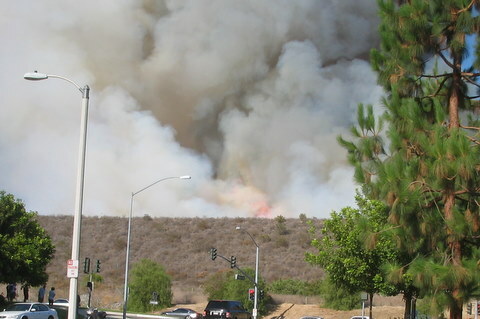 The fire jumped over the 261 Freeway and came down the hill to Jamboree Road. This is less than 100 yards from our house. 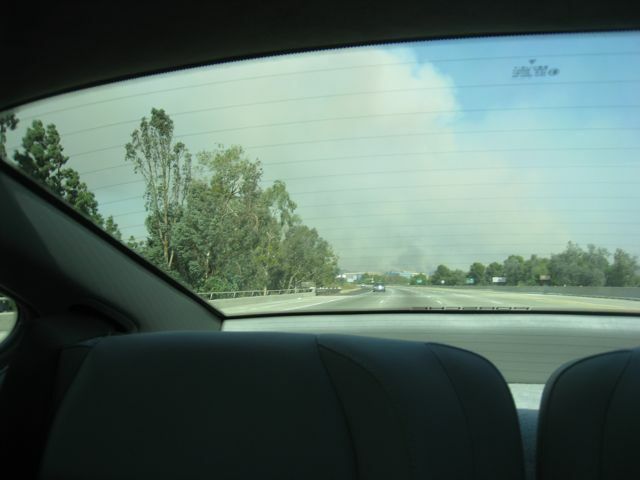 This first picture is in the late afternoon before it jumped the 261 Freeway. You can see the reddish flames in the background. 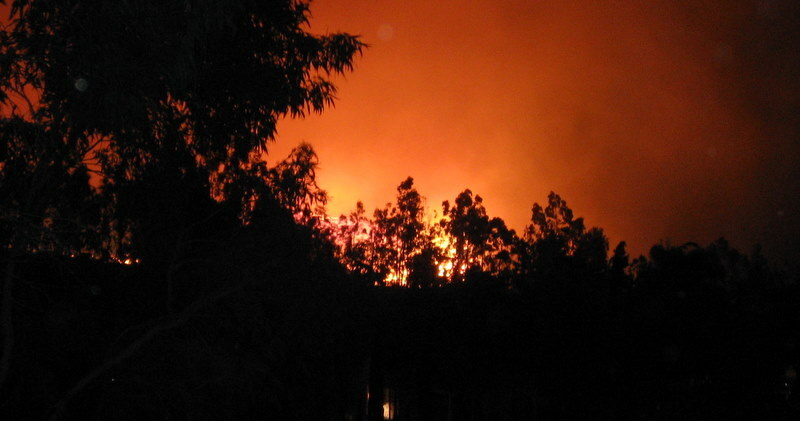 This next picture is from our back yard at about 9:30pm. 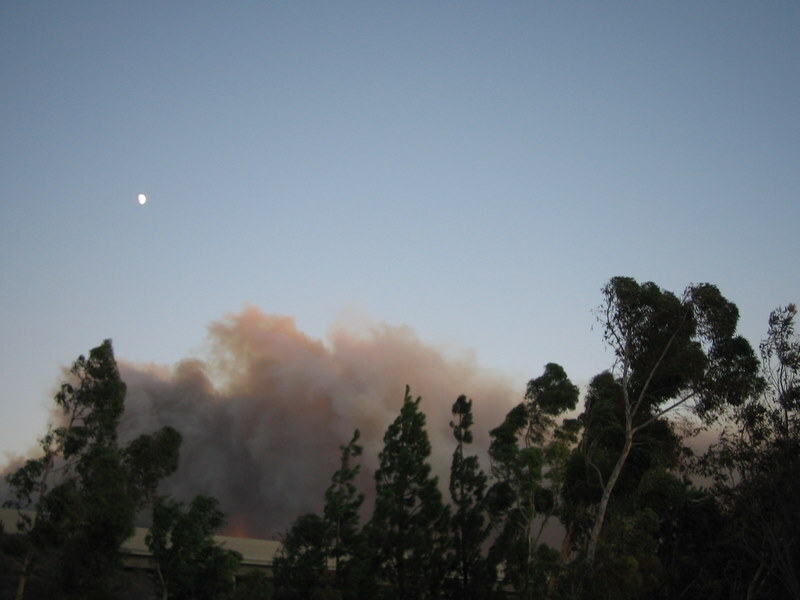 The wind was blowing left to right (in the picture) and there were very large embers blowing across our yard. We went to Binny’s house and the kids and Anjali spent the night there. 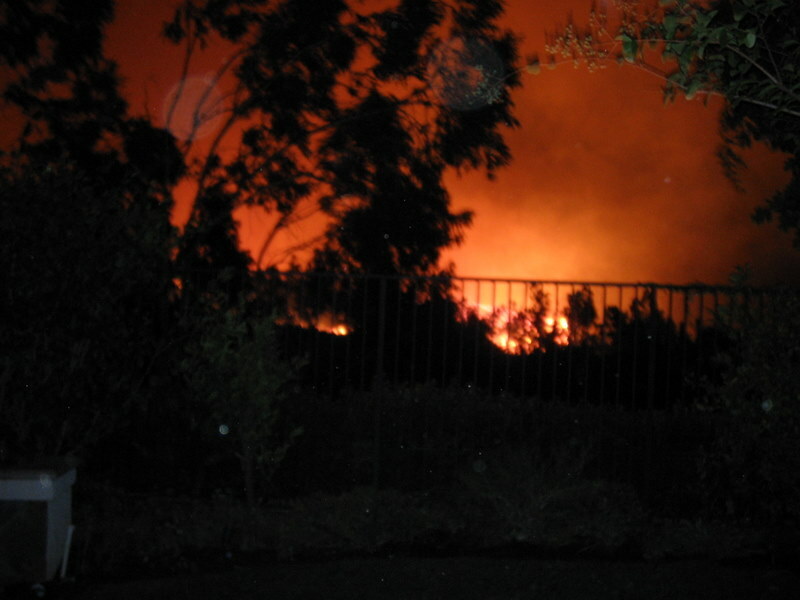 I returned back at about 1AM as the raging fire was over. By morning, the fire had died down and we were able to return to our house. The kids were a little scared but everyone is doing well. 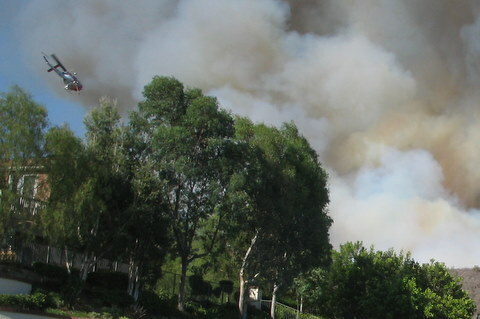 Today we had a little excitement with a large brush fire late this afternoon right behind our house. 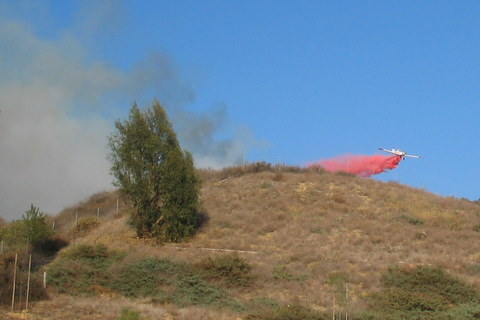 There were fire engines from Anaheim, Garden Grove and Tustin as well as 4 fire helicopters and 3 fire planes carrying retardant and water. We were all packed and ready to go! Luckily the fire fighters have beaten down the blaze and all is well! Here is a picture from the intersection of Jamboree and Pioneer. You can clearly see the flames! After about half an hour, the helicopters and planes started showing up. Here is one with a fire plane. Here is one from our next door neighbor’s house!